Worms are an unwanted parasite that can cause your pet to become very sick if they are infected. Some cases can even be known to cause death amongst animals. These little pests must be stopped from getting anywhere near your beloved pet, which is why keeping up-to-date with worming your pet is crucial for their health and wellbeing. This month's product of the month takes a look at Drontal Allwormer which is one of the top recommended products available to help with the fight against worms. 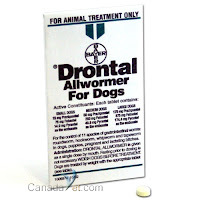 Check out the full Drontal Allwormer product spotlight here.